The UK’s leading door manufacturer, Hörmann, will be returning to the Homebuilding and Renovating Show this year as a headline sponsor. Visitors to stand D131 will have an exclusive look at Hörmann’s latest range of products. On display will be products from the whole portfolio including two new sectional garage doors, timber internal door sets and steel entrance doors. Experts from Hörmann will be on hand throughout the show to talk through the benefits of the range and offer advice on the key things to consider when choosing doors for upcoming property renovations. For anyone wanting advice specifically on choosing internal doors, Mark Lester, Internal Door Manager at Hörmann, will also be conducting a ‘Timber Internal Door Masterclass’ session on Thursday 28th March. During the session he will be highlighting the key things to think about when choosing internal doors. 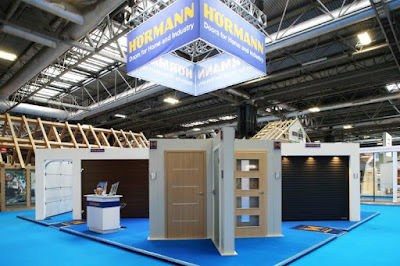 He will also take guests through Hörmann products, including the timber door sets, which were launched at the Homebuilding and Renovating Show in 2018. “We have been attending the Homebuilding and Renovating Show for over ten years and every year has been a huge success, so coming back this year as the headline sponsor made perfect sense. Available from hundreds of UK locations, visit www.hormann.co.uk for more information, or call 01530 516 888 to find details on your local distributor.